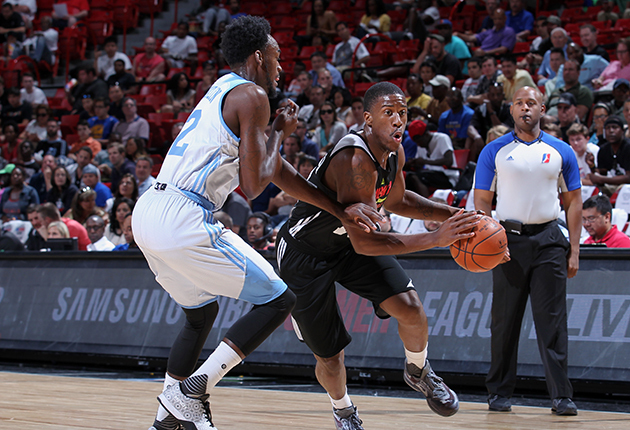 On the brink of making the Atlanta Hawks roster, Lamar Patterson faces one more challenge in a career filled with them. Atlanta Hawks guard Lamar Patterson looks down at a dark gray square with two clear, glass panels running through its interior. In the middle, a circle glimmering with a blue backlight flashes a number in black: 213. It’s the lowest Patterson has weighed since his sophomore year in high school, when he starred for the nearly unbeatable McCaskey Tornadoes in his hometown of Lancaster, Pa. The No. 48 overall pick in the 2014 NBA draft steps on the scale each morning, peers down at his toes and snaps a photo to text his girlfriend India Hall, agent Adam Pensack, and Hawks team nutritionist Marie Spano. While all three of Loreen Patterson’s boys played collegiate athletics, stockiness runs in the family. “They tend to gain quickly,” she says. Loreen partnered with her mother, Barbara Cameron, to raise the boys after she split with Perry Sr., and they raised hell in the kitchen. "Each Sunday featured fried chicken, [the] most greasiest and unhealthiest way to cook it,” Perry says. Patterson cherished his mother’s spaghetti. Loreen cooked in a gigantic pot, each boy shoveling mounds of pasta onto his plate until the dish completely disappeared into their bellies. “No food went to waste in my house, I’ll tell you that,” Loreen says. Patterson has turned one of the oldest sports clichés into a reality, molding his 6’5” frame quite literally into the best shape of his life. He’s shed 22 pounds since returning from a year playing for Tofas Bursa in Turkey (he weighed 226 entering the NBA draft). And after solid Summer League averages of 13.1 points, 3.4 assists and 1.6 steals in seven starts, the Hawks signed him to a three-year contract. With a sudden hole on the perimeter following DeMarre Carroll's departure to Toronto, it was now or never for Patterson to finally drop the weight. “What Atlanta wanted to see is: How badly do you want to to play in the NBA?” Perry says. Steve Powell first met Lamar Patterson as he yanked the two-year-old boy’s foot from the spoke of a bigger boy’s bicycle wheel. From the moment he could walk, Patterson tried to follow his older brothers to Powell’s summer clinics at a nearby park. When he was lucky, Perry, who is seven years older, allowed his younger brother to accompany him. Patterson would play on the adjacent jungle gym and stare through the fence as his older brother dominated the basketball court. “It was like being with your superhero all day,” Patterson says. He sat in the stands for all of Perry’s high school games, his eyes never leaving his older brother as he memorized each of Perry’s moves. “When I see him play, there’s no way he didn’t get that from me: The passing and the dribbling,” Perry says. Lamar later started playing football in addition to basketball—only to prove he was superior to Perry. He quit the sport before his senior year, though, after the offensive line crumbled far too often, leaving him susceptible to devastating sacks. He set a goal and succeeded at scoring higher than Perry on the SATs. Patterson transferred to St. Benedict’s in New Jersey for his senior season, just 32 points shy of joining Perry in McCaskey’ 1,000-point scorers club. When Patterson returns for the school’s annual Christmas Day alumni game, only Perry’s name is emblazoned on the red banner in McCaskey gym. “Every time I go back and look at that banner, I’m like... Man,” Patterson says. One morning in September 2010, Patterson drove down Forbes Avenue en route to class, cruising through the Oakland section of Pitt’s campus when a car stopped abruptly in front of his Volkswagen Jetta. As Patterson tried to jam on the brake, his flip flop became caught on the gas pedal and the car’s turbocharged engine roared. Patterson veered to the right to avoid rear-ending the vehicle, sending his car flying through the corner of a curbside conference room in Pitt’s Eureka Building. Today, Patterson says three barriers protect the corner of the building from the Forbes Avenue traffic. The accident is buried beneath countless moments of Patterson starring for Jamie Dixon’s Panthers. 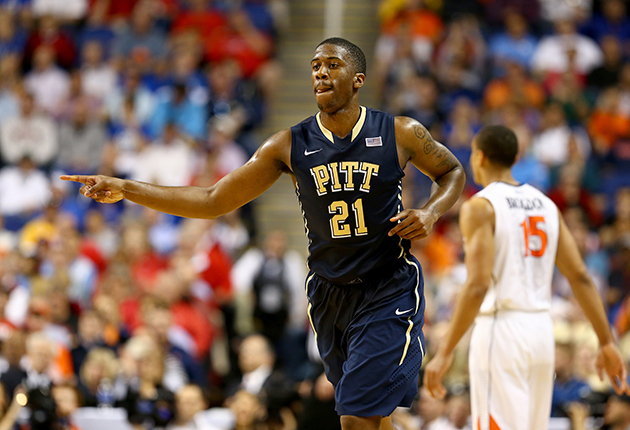 Patterson led Pitt in scoring (17.1) and assists (4.3) in his senior season, guiding the Panthers to a 26–​10 record and the third round of the NCAA tournament in 2013–14​. “He was playing at as a high a level as anybody in the country,” says head coach Jamie Dixon. It took four years for Patterson to blossom under Dixon after first setting foot on campus as a nearly 250-pound, 17-year-old small forward. Dixon’s staff has a history of transforming heavier recruits, with NBA players Aaron Gray and DeJaun Blair as his greatest success stories. Similar to those players, Patterson’s progression certainly didn’t occur overnight. “There were times where we didn’t think it was going to happen,” Dixon says. The Pitt staff coaxed Patterson into extra conditioning—stints on the elliptical, stairmaster and treadmill—and each player met with the team’s nutritionist. Patterson kept shedding pounds until he hit 216 on the scale. He was the focal point of Pitt’s offense and NBA teams began to take notice. Patterson’s family and close friends gathered in a private room at the downtown Marriott in Lancaster, Pa., dining on a buffet and enjoying an open bar. Several teams in the middle of the second round had expressed interest in the Pitt graduate, especially the Hawks, who owned the No. 43 overall pick and hosted Patterson in Atlanta for two pre-draft workouts. The subsequent picks came and went with increasing speed, then Patterson’s cell phone finally rang—​it was Pensack. The Hawks were making a move with the Milwaukee Bucks, sacrificing their 2015 second-round pick to acquire Patterson at No. 48. Patterson followed the success of the Hawks’ system under head coach Mike Budenholzer as best he could while overseas. He stayed in touch with Dennis Schroeder and Adreian Payne, before he was traded to the Minnesota Timberwolves. Atlanta’s international scout Ojeda Perez visited Bursa multiple times to check in with Patterson. As Bursa’s losses mounted, Patterson struggled to keep his weight down. The language barrier provided another obstacle, preventing Patterson from ordering healthy foods. “It took me until coming home to realize what [Atlanta] meant by tip-top shape,” Patterson says. Each step on the scale now provides a small victory for Patterson. He feels primed to make the most of his opportunity, a chance at contributing to a legitimate Eastern Conference contender. With 13 players under contract and 2013 second-round pick Mike Muscala a virtual lock to make the roster, Patterson will likely battle Nebraska’s Terran Petteway for the Hawks’ 15th spot.